Dennis Tenen. Plain Text: The Poetics of Computation. Stanford, Calif.: Stanford University Press, 2017. 280 pp. What does close reading look like in the digital age? Dennis Tenen’s answer: computational poetics. By analogy with close reading of a print literary work, which carries out microstylistic analyses of word choice, homophonic variants, and so forth, computational poetics is a “strategy of interpretation capable of reaching past surface content to reveal platforms and infrastructures that stage the construction of meaning” (p. 6). There are several claims packed into this formulation: first, the nature of the sign in digital media is complex, reaching beyond the screenic inscription into the underlying levels of code. Tenen’s phrase for this complexity is “textual laminate.” We may regard this claim as self-evident, but the skeptical critic would respond, okay, but what difference does this make? According to Tenen, it changes everything, because the underlying code layers “affect all higher-level interpretive activity” (p. 4). At a time when resistance against symptomatic/ideological reading has been mounted on several fronts, including the “surface reading” championed by Sharon Marcus and Steven Best and others, Tenen’s approach offers another way to think about ideological analysis: not staying on the surface of a (presumably print) text but delving into the encoded interior of the digital text. “Reified into objects, books morph into devices—no longer lasting and transcendent but rather immanent and contingent—firmly determined by their instrumental affordances. The literary device adapts itself to the situation—to the needs of both the owner and the user of the book—by hidden logics” (p. 130). The principle literary device he discusses is metaphor, labeling computers “metaphor machines.” In simulating traditional media affordances such as print pages, trash cans, and diacritical marks, graphical interfaces on computers conceal from users the actual workings of the code that erases a file, replaces one screen of text with another, or introduces a new symbol for a previous one. “Our grasp on the medium weakens the more convincing the simulation,” he observes (p. 38). Moreover, not only do such metaphors reassure us that our intuitions about print media are still relevant, they also affect higher-level interpretations. “More than superficial embellishment, skeuomorphic metaphors enacted at the digital surface affect all higher-order meaning-carrying units, from individual letters to words, paragraphs, chapters, pages, and books” (p. 39). If “traditional theories of textual interpretation rely on properties and assumptions attached to print media,” then “how can literary analysis—close reading, philology, hermeneutics—persist without the fixity of print?” (p. 40). As an example of such perplexity, he instances a friend who buys an ebook of a work that he wants to share with Tenen and is puzzled why he cannot. The ebook version, although purchased new, was “already marked and highlighted. It was synchronized with other media: audiobooks and related television promotions. The work was preprocessed, in both the technical and social senses of the word, to privilege certain meanings and modes of comprehension” (p. 5). It takes no great stretch of imagination to suppose that more overt interventions might also be made, much in the way that targeted internet ads are already tailored, varying by region, ethnicity, gender, and other variables to make the content more appealing, more conducive to commodity purchases, more seductive to the reader. If this strikes you as far-fetched, Tenen points out that the copyright protections preventing his friend from sharing his ebook are encrypted into the code. Whereas enforcement about what could or could not be printed relied on external legal structures such as obscenity laws and piracy protections, now such constraints have moved inward into the device. “The codified contract is in fact tamper-proof; it is resistant to physical access and therefore interpretation” (p. 127). Making matters worse is the Digital Millennium Copyright Act (DMCA), which criminalizes any attempt to access, interpret, or intervene in the encrypted constraints. Horror stories abound about people who ran afoul of this law, including a Russian programmer who, discussing at a security conference how to make Adobe electronic book files into a PDF, a process that could potentially remove embedded digital rights management protections, was arrested and detained for several months. As Mireille Hildebrant has pointed out, the encrypted protections also violate the very spirit of contract law, which as Tenen observes, traditionally requires the uncoerced consent of both parties who know what the contract specifies. “Contracts between authors, publishers, and readers must exist in an objectively verifiable manner that is mutually accessible for analysis.” However, “the lack of access to deep structure exposes a glaring problem at the heart of smart contracts . . . smart contracts purposely obscure the terms of such agreements. Readers lack the physical means to examine their obligations or to analyze interests embedded within the document’s encrypted, tamper-proof layer” (p. 129). Implicit in these legal considerations is the role of writing and reading as activities crucial to an informed citizenry. The antidote is computational poetics, which “insists on recovering the full shape of the inscription, across surfaces and domains. It makes the extent of the dissimulating figure available for interpretation” (p. 41). Does this mean that all literary critics must now become competent programmers to carry on analysis of digital texts responsibly? Tenen, who combines professional programming experience with training in literary analysis, might respond in the affirmative, but to my mind a more measured response is to regard the kind of historically grounded analyses he enacts as analogous to the history of the book for print criticism. Certainly, critics of print could benefit from knowledge of this field, but few would say it must be a necessary prerequisite for undertaking any critical act. Similarly, the kind of historical archives from which Tenen draws enhance our understanding of how and why computational code developed as it did, but as he acknowledges, the textual laminate flattens down when the output is print, even if it began as a digital file. While one can argue that word processing affects not only the format but the thinking involved in literary creation (an argument made from the 1960s on, first by Douglas Engelbart and most recently by Matthew Kirschenbaum in his masterful account of literary word processing in Track Changes), once printed out, traditional methods of close reading are still applicable. 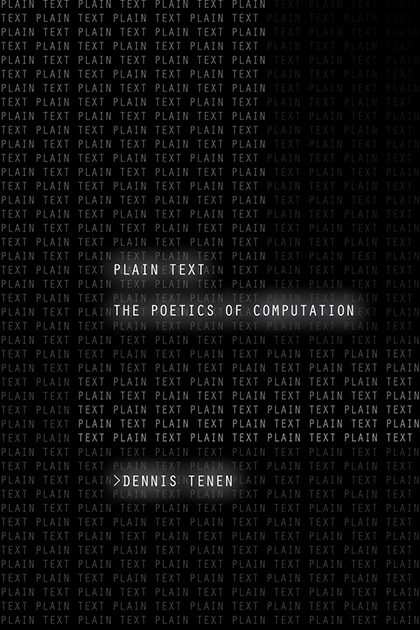 I take the point to be rather what the field of computational poetics can add to our existing repertoire of literary methods, and on this score, Tenen is absolutely convincing. Take as a case in point his discussion of format. One fascinating bit of trivia he cites is that “hello world,” the phrase traditionally used to teach how to program language output, takes up 11 bytes on the hard drive when programmed as plain text, but when encoded as a PDF file, demands an astonishing 24,335 bytes. The PDF specification includes features such as accessibility data for those with disabilities, electronic fillable forms to gather data, preservation of format independent of the device, platform and software, security and permissions. Recounting the history of how such software developed, Tenen highlights the importance of mixing format commands with data in the same input stream, an innovation he dates back to the automated printing telegraph such as that invented in 1905 by Donald Murray. Such innovations “drove the wedge further between human and machine communication,” “one surface facing the human, the other the machine” (pp. 141, 96). Leading up to the format discussion is one of the book’s best parts, on Alan Turing’s universal computing machine. Starting from Searle’s famous Chinese Room thought experiment, Tenen succinctly re-states the problem of what “understanding” means by equating it with creating an internal state that corresponds to an external representation such as a letter or word. On how this happens in the human brain, he has nothing to say, waving the question aside by calling reading a “profound myster[y] of comprehension” (p. 71). Following Turing’s developing thought from the lectures by Wittgenstein he attended at Cambridge to his 1950 “Computing Machinery and Intelligence,” Tenen eloquently shows how the universal computing machine requires only three essential elements: “(1) a notational system that represents machine states; (2) storage media capable of bearing inscription; and (3) a mechanism to transform symbolic notation into machine states” (p. 80). By mixing commands with data in the input stream, the conceptual computer Turing described is able not only to process data but also to change its own programming, thus making it a “tool for ubiquitous symbolic manipulation” (p. 83). “The computer extends its reach broadly not because it quantifies life,” he comments, “but because much of human cultural and cognitive activity is already symbolic in nature” (p. 81). This is a fine insight, but unfortunately, his argument is at its weakest when he tries to consider how humans and computers form cognitive assemblages. He falls back on the facile assumption that humans must maintain a “robust model of agency,” although it is already obvious that agency, like cognition, is distributed among humans and cognitive devices (p. 11). This caveat notwithstanding, Plain Text adds to the impressive work of such computationally savvy theorists as Wendy Hui Kyong Chun, Alexander Galloway, Alan Liu, Rita Raley, and others to make a clear, forceful case for computational poetics as a necessary literary practice in the digital age. Why the title? Plain text is both “a file format and a frame of mind,” a preference for minimalist coding that is accessible, legible, and available to all who seek to understand it (p. 3). I give to the author the last word: “It is . . . in our broadly human, civic interest to keep such mechanisms of constraint visible to view, under continual scrutiny of critical, close, and closest possible reading” (p. 195).